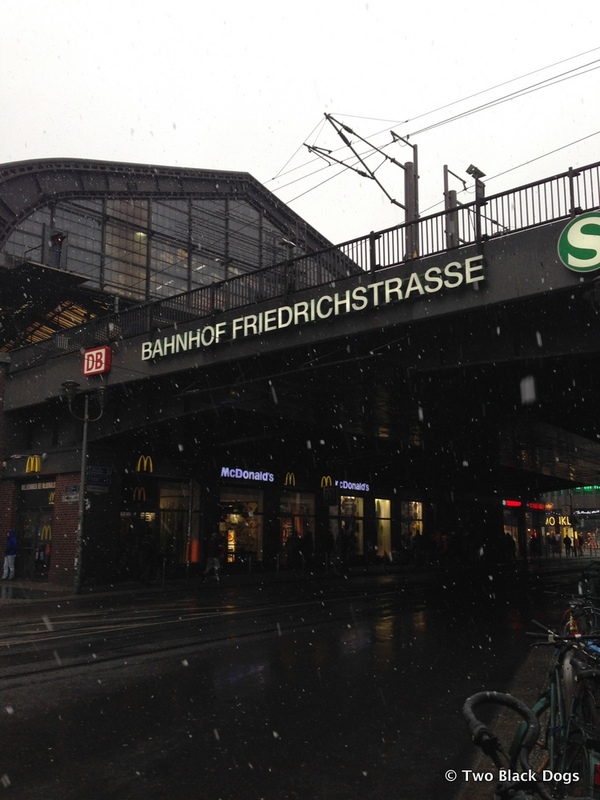 The train trip from Innsbruck to Berlin was a long one, 8 hours sitting and wondering what Berlin would be like. Anyone we knew that had visited Berlin said it was amazing and awesome, I was worried that we wouldn’t like it as much as our favourite cities in Italy because it was so new in comparison. Little did I know how wrong I could be. Our first full day was spent in the company of our Polish friend Tomasz, his girlfriend Barbara and Tomasz’ s family friend we called Boogie. Boogie had lived in Berlin for 40 years and she had lots to share, starting with a visit to her place of work: the Humboldt University library. 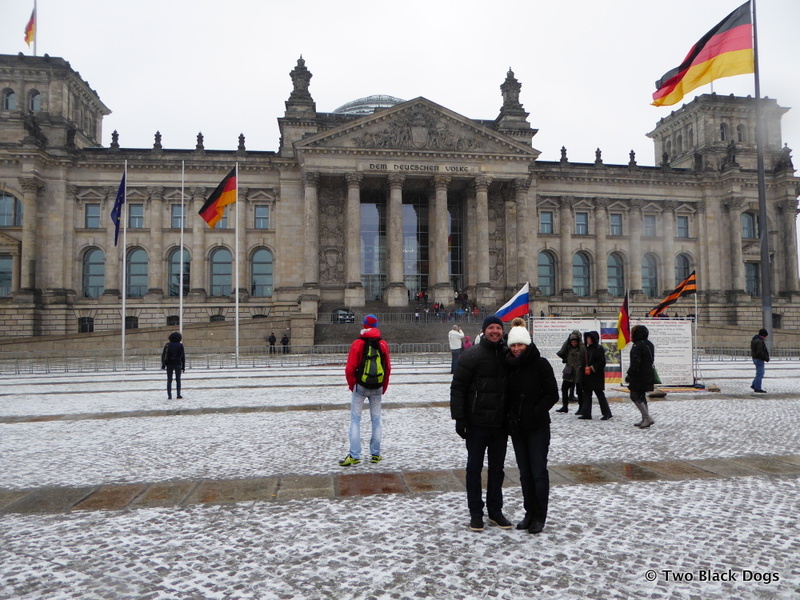 We had woken up to a light sprinkling of snowflakes, the temperature and our noses got colder as we walked along the river to the Reichstag and our smiles got wider. As cold as it was, Marty and I were loving our walk in the snow and it seemed incredible to be standing under an umbrella, watching as snow fell one of the world’s most famous and modern, government buildings. Our friends were used to this inclement weather and our enjoyment amused them greatly. Tomasz did a bit of translating for Boogie, her English was good but she sometimes searched for the right word so Tomasz would help out and often he would add a little something extra and we would all end up having a good laugh. We didn’t spend the day doing all the typical things that tourists do in Berlin, Boogie wanted to open our eyes to what life was like during the cold war and when she first moved to Berlin so she took us to the “Palace of Tears” or the Tränenpalast,the former border crossing at Berlin Friedrichstraße station where East Germans said goodbye to family and friends going back to West Germany. The Tränenpalast museum is now a modern history museum, the exhibits highlighting the division between east and west and how that impact the lives of Germans during the Cold War era. It is free to visit, but handbags have to be left in a locker which cost 1 or 2 euros. Adding to that experience was a visit to the DDR Museum. The DDR Museum is an interactive experience that gives the visitor the opportunity to see what daily life was like in East Berlin. Hubby had a simulated driving experience in a Trabant, a popular and cheap car for East Germans and apparently not that easy to ‘drive’ as the experience ended with a crash into a pole. I enjoyed exploring the living room and kitchen installations, the formica and colour scheme reminding me of some of the cheaper places I lived in as a university student. Boogie also led us out of the centre of Berlin, several trains and buses later, to find a well known, popular vegetarian restaurant. I stopped counting how many changes we made after the first couple of stations and I had absolutely no idea where we were, thank goodness for Boogies. By the time we reached our destination, the smiles had worn off a little and our feet were cold and wet. As it turned out the restaurant was closed until later that day, feeling famished we entered the nearest open restaurant and proceeded to order a Chinese banquet. The food was fresh, tasty and very cheap and the time spent there allowed our shoes to dry a little and our feet to warm. Without Boogie we would never have found a delightful ‘village’ in the middle of Berlin, she took us to a restaurant that specialised in potato dishes and showed us beautifully decorated buildings. 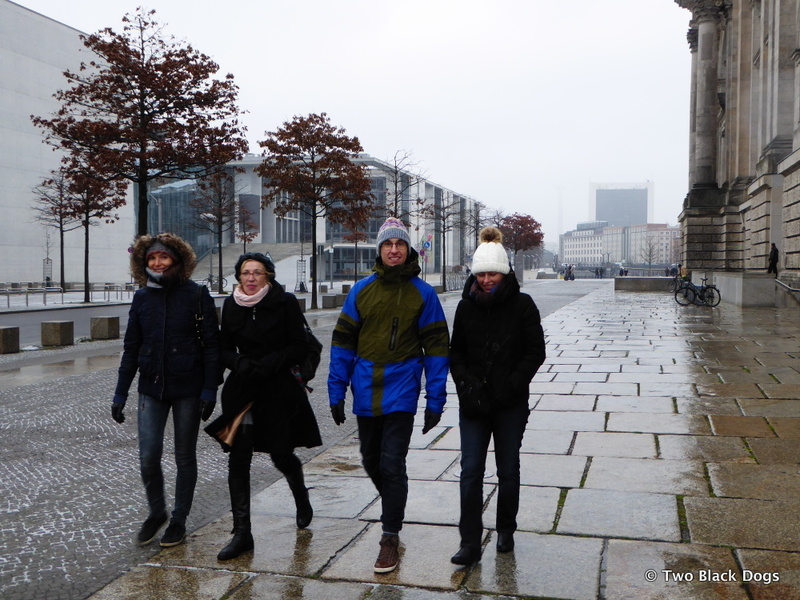 It was a truly wonderful introduction to Berlin, I’m not sure we would have loved this city as much without the Boogie walking tour and the company of our friends Tomasz and Barbara. This post is motivated by the latest travel theme challenge on ‘Where’s my backpack‘.